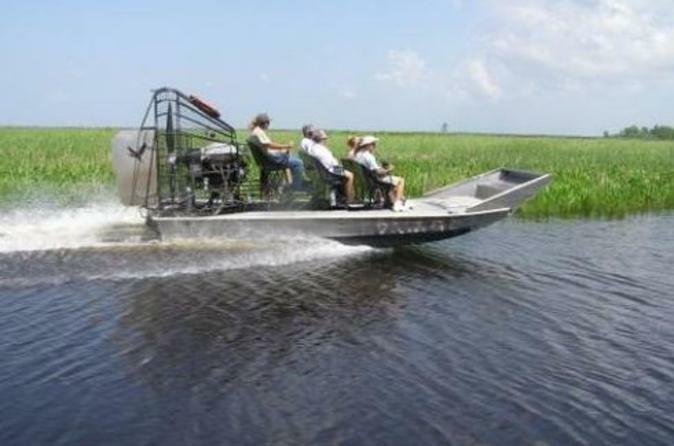 After your cruise has docked at the Port of New Orleans, set out on an exhilarating hour and a half airboat ride deep into secluded bayous in Cajun Country. You will see all sorts of wildlife on your journey -- alligators, giant catfish and nutrias. Continue your adventure of the deep south as you make a trip to Destrehan Plantation for a glimpse into the historic past of New Orleans. Once you've disembarked your ship at the Port of New Orleans, your guide picks you up and takes you to the quaint and remote Cajun Village close to Paradis, LA. Here, you embark on a high-speed ride onboard small airboats, comfortably gliding over marshes and venturing deep into secluded bayous for about 1.5 hours. You may even get to hold a baby alligator, feed giant catfish, or meet a nutria face to face! Then, travel to the Destrehan Plantation for a guided tour. This historic plantation, on Louisiana's Old River Road, is a lavishly restored Greek Revival antebellum mansion. Here you will have free time to enjoy lush gardens and majestic live oaks.